Millions Of Dollars In Speech Fees Support Clinton Foundation : The Two-Way Bill, Hillary and Chelsea Clinton charge hundreds of thousands of dollars to talk to banks, universities and other groups, and give the proceeds to the family's philanthropic foundation. Former President Bill Clinton speaks earlier this month at a conference in Marrakesh, Morocco, sponsored by the Clinton Foundation. Hillary, Bill and Chelsea Clinton brought in millions of dollars for their charitable foundation through paid speeches. They gave the honorarium to the organization. This is the latest release of information about the foundation's funding, as a result of Hillary Clinton's presidential campaign. Last week, the campaign filed a financial disclosure showing that since January of 2014, Bill and Hillary Clinton made more than $25 million dollars in paid speeches. Thursday's release from the Clinton Foundation begins to complete the picture. 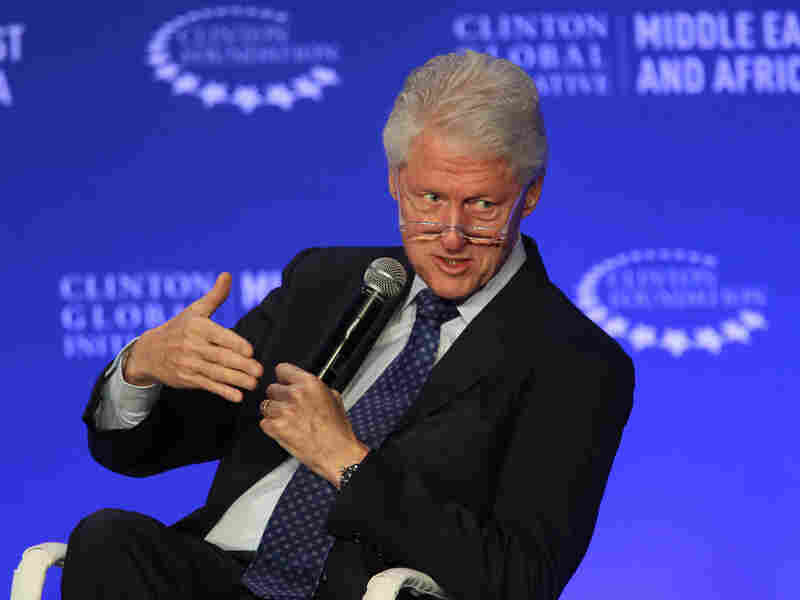 The Clintons' speaking fees brought between $12 million and $26 million to the foundation since 2002. The foundation didn't put a precise dollar figure on the fees, but rather a range. The former president gave three speeches that paid between 500-thousand and a million dollars. Hillary Clinton gave most of her talks to universities and big banks, while Chelsea Clinton addressed a handful of Jewish Federations. The speech fees had not previously been disclosed as donations. The Washington Post reports that the foundation considered the money as "revenue," coming from the Clintons, and not donations from the groups that paid for the speeches.